Rupali Bank Job Circular 2019 has been published yesterday via daily newspapers and television media. Human resources division of Rupali bank ltd has announced the vacancy. Minimum graduation of any concentration they can apply for this post. An applicant can apply for it via Bangladesh bank recruitment website. You can also see Sonali Bank Job Circular. 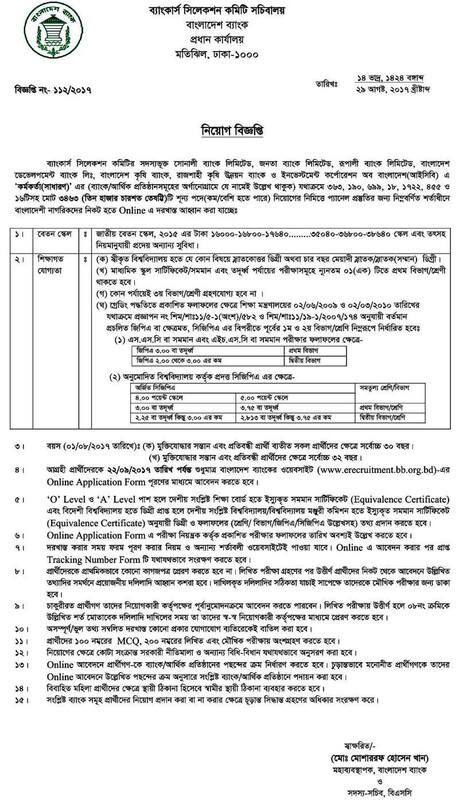 Education Qualification See Job Circular Image. Rupali bank offers various service to their Customer. Services of Rupali bank Ltd are savings account, fixed deposit, short notice deposit, rural festival deposit scheme, Rupali student savings account, powerful for child, infrastructure development, corporate banking, 24 hours ATM facilities, Q cash etc.Rupali bank ltd has two subsidiaries one is Rupali investment another is Rupali securities ltd.Rupali bank ltd also perform various social responsibilities such as sponsoring in various national aid, funding in national disesters, help food affected peoples donate fund to prime ministers welfare fund. Rupali Bank Ltd employee’s selection examination is very much competitive, every year more than 2 lakh registered for the vacancies of the Rupali bank Ltd via Bangladesh bank recruitment website. A candidate has to pass three stages of examination one is preliminary test based on Bangla, English, general knowledge, history of Bangladesh, geography etc. candidate can be selected for appointment if he/she pass preliminary test, written test, and final viva voce.besides Rupali bank ltd offer attractive salary package to their employees under national pay scale and offer provident fund, gratuities, pension scheme, retirement benefits etc. If you think you are the best one you can go for it.